American Tribal Style® Belly Dance (ATS®) is a modern style of dance created by FatChanceBellyDance® director, Carolena Nericcio. In 1974, Carolena began dancing with Masha Archer and the San Francisco Classic Dance Troupe. Masha’s style was an eclectic blend of classic Egyptian, Folkloric, and any other influence that she found enticing. In 1987, after the SF Classic Dance Troupe disbanded, Carolena began teaching in a small studio in the Noe Valley Ministry. Her only goal was to teach people to dance so she could have dance partners. Being young and tattooed, Carolena attracted other young people living alternative lifestyles. The Modern Primitives movement was also underway. Tattoos and primitive styles of body adornment were the vogue. 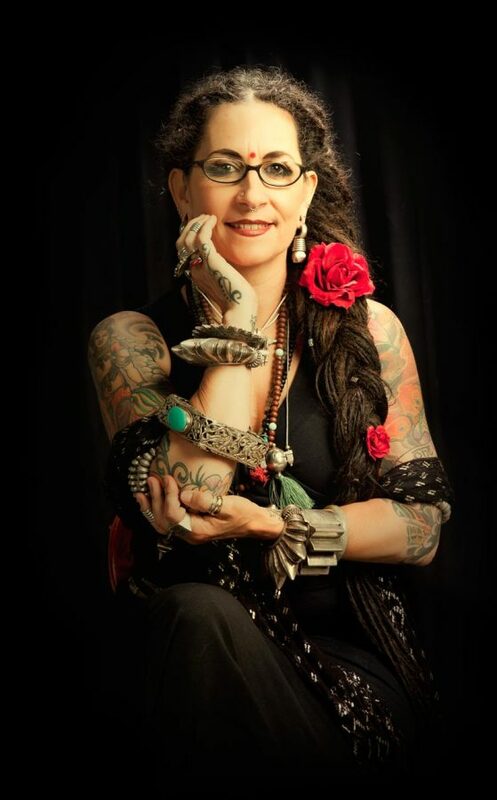 Carolena and her students performed at tattoo shows and conventions and became well known in the City by the Bay. Carolena Nericcio is the dynamic founder of the worldwide dance phenomenon called American Tribal Style® Dance. An early fascination of permanent body adornment lead 8-year-old Carolena to request that her father, Carl, a collector himself, to buy a ring she could “wear always and not take off”. This concept evolved into the study of folkloric textiles, a body full of tattoos and a collection of jewelry and textiles from around the world. The discovery of belly dance led to the creation of her own dance style, American Tribal Style® (ATS®) Belly Dance. FatChanceBellyDance® was founded by Carolena Nericcio in 1987 and immediately captured the attention of audiences worldwide with stunning dance performances featuring majestic costuming and layers of tribal jewelry. The music, a carefully chosen collection of both traditional sounds and modern fusion adds to the effect. American Tribal Style® looks old, but it is actually new. Carolena has compiled a montage of different “tribal” elements into what has been coined American Tribal Style® Belly Dance. ATS® movements are inspired by folkloric dances of the Middle East and India. Aesthetically ATS® is based on the richness of textiles and jewelry from North Africa and India. ATS® is a method of improvisational choreography, using a vocabulary of natural movements and cues allowing the dancers to communicate via gesture and eye contact when dancing together. The effect is a vibrant thread drawing the audience into the tapestry. Currently Carolena directs FatChanceBellyDance® at her studio and resource center in San Francisco, CA. She masterminds the business side of the Nakarali Jewelry Company, co-owned with Colleena Shakti. Students can find studio classes in San Francisco, via Skype, and On-line Classes. Instruction is further augmented by a collection of instructional DVDs and international workshop travel. Through workshops such as Tribal:Pura with Megha Gavin, Carolena and her FatChanceBellyDance® instructors take ATS® around the globe. In addition to instruction, Carolena provides business consultation in the form of Tribal Counsel and ATS® Troupe Consulting. When she’s not traveling the globe or working at her studio, Carolena enjoys spending time with her partner Loretta Nericcio, exercising, sewing, knitting and reading. Megha began performing very early in life. She took her first dance classes at about the age of 4 and has been creating and performing ever since. Theatre soon caught her attention and that was her passion throughout her schooling years. It was in 1996 that she discovered American Tribal Style® Bellydance and immediately shifted her focus to this art form. In San Francisco, Megha studied ATS® with the originator of the style from 1996 – 1998. Upon returning to the Southeast, she began teaching ATS® classes in order to create a community of people to dance with. She was the first to offer these classes in this region and has continued teaching pure ATS® for the last 16 years. She continues to teach and perform at sold out workshops across the country and around the world both individually and on the Tribal Pura tour with her teacher/partner, Carolena Nericcio. In 2003 Megha completed teacher certification with Carolena Nericcio (creator of ATS® and founder of FatChanceBellyDance®) and entered into an exclusive partnership with her. They now take their love and appreciation of this elegant dance style in its original form on the road to co-teach the technique and artistic vision created by Carolena over the last 25 years. Megha directs the Birmingham, AL based “Devyani Dance Company.” Under her direction, Devyani has performed at countless theatrical events, festivals, weddings, corporate events and private parties over the last 15 years and has been nominated for multiple cultural and artistic awards. In January 2014, Megha moved to Dallas, TX and while still directing Devyani, she withdrew from teaching weekly classes and shifted her focus instead to the Tribal Pura International events and offerings with Carolena Nericcio. When not teaching and performing ATS®, Megha homeschools her daughter and studies plant based nutrition, reiki and essential oils. Would you like to become a Teacher? Do you have a dance studio that you want to affiliate with FatChanceBellyDance®? Or perhaps you simply want to take your skills to the next level. Tribal Pura International is the new business entity created by Carolena and Megha to bring you classes and workshops to teach General Skills, Teacher Training and The Business of ATS®. In addition, Tribal Pura International will continue to provide you with workshops featuring Carolena and Megha. What does this mean for you? It means that you will still be receiving the same high quality workshops and training that you did when FatChanceBellyDance, Inc. was in charge of the General Skills, Teacher Training and Tribal Pura workshops. The administration of these programmatic elements will just be housed under Tribal Pura International rather than FatChanceBellyDance®.